With the Duplo Auto Bookie Pro presenting your documents in a booklet format could not be easier. Enhance your document presentation by turning printed sheets into finished booklets in seconds. The Duplo Auto Bookie Pro is a fully featured model, with automatic paper size settings, fine adjustments, automatic folding and stapling of booklets. 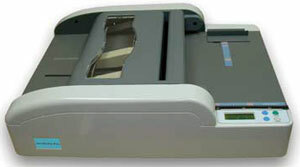 The stapling is controlled by an automatic timer (with up to a 20second delay), which counts down from the moment the set is placed in the unit and will automatically process the document when the time is up. A clear LCD display guides the user through the simple set-up as well as displaying a total count of completed booklets. In addition to standard A4 and A5 booklets, the Auto Bookie Pro also allows the user to set up to 6 additional memory settings. 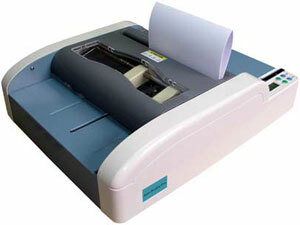 Furthermore, simply remove the staples and the Auto Bookie Pro can also be used to simply fNEW documents. Ideal applications include those typically generated by schools, churches and associations such as newsletters, handbooks, information booklets and local magazines.